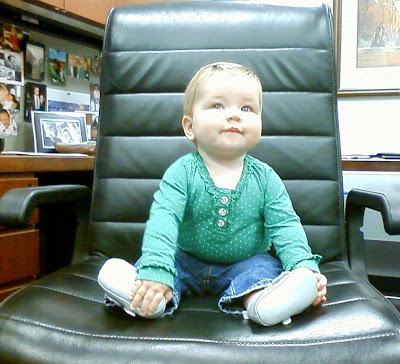 I'm in charge now! Cessna better watch out for this little lady! Some of my baby shower pictures were used for an article that my friend Emily wrote. Check out her article about baby shower decorations at Blissfully Domestic. Julie and Lori are two of my friends from high school. Julie (on the left) and I were also roommates at K-State. I love decorating for baby showers. I got this idea from my friend Emily. Thanks Emily! a cute little diaper cake. The girls got a lot of cute things for their baby boys. Julie is Baby Ori's mom (he was born one month ago). Lori's little guy is due at the end of November. It was a fun day. Thanks for coming girls! Goodbye Kansas. We were off to Houston. Cora experienced her first plane ride and weekend with the girls. Traveling with a baby was quite the adventure. Thankfully my mom and sister were there to help me juggle all the baby "stuff". The trip started out a little rough as I waited at the ticket counter only to find out that my driver's license had been expired for two months. Oops! The lady at the ticket counter said I could still fly, but when I went through security they would have to do a thorough check and go through all of my luggage. I smiled and said "ok" as I imagined them going through ALL of my stuff and ALL of Cora's stuff that was so carefully packed. Guess what? When I went through security they didn't even notice (which is a little scary, but I was very thankful). I was relieved to finally be on the plane and taking off. On one of our flights we even had a little room in front of our seats where Cora could play on the floor. She thought it was great! We were all worn out from our early morning and airport adventures, but not to tired to hit IKEA first. My sister had never been to IKEA. She was so excited. We had to take a picture to document the important event. OF COURSE, we brought an empty suitcase along to bring home our precious shopping treasures. Who wouldn't want to bring home a suitcase full of napkins and candles?? Cora stayed awake almost the whole time we were at IKEA. She was so tired, but kept holding those little eyelids open. She finally crashed the last few minutes before we checked out. She was such a trooper! Joel was so pleased to find out that she was a born shopper! I think my little baby is worn out. Cora and I got back from Houston late last night. We had a wonderful time, but were ready to come home. Cora missed her daddy so much (I missed him too). You should have seen the hugs she was giving him at the airport. It was too cute. Cora is exhausted, so we spent the day recovering. I will post more pictures from the trip later this week. This weekend I got together with some of my teacher friends from Slate Creek. Last year three of us had babies all about the same time. 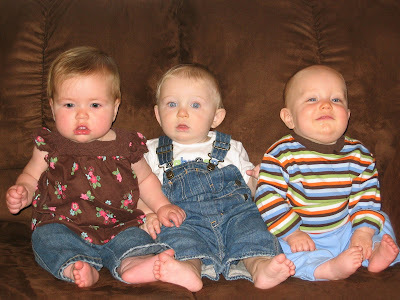 Cora, Mason, and Braden are all seven months old. It was fun to see you all! This is Cora's newest friend Orrin Drake. My dear friend Julie and her husband Ian welcomed their little boy into the world last week! He surprised his parents by coming six weeks early. I guess he just couldn't wait any longer to meet them. Ori has been in NICU since he was born, but is doing great! He is such a little sweetheart and looks so much like his daddy (at least I think so). Julie is a WONDERFUL mother and is being so loving and patient through all the ups and downs. She is so faithful to trust God and has such a positive attitude even as she spends those long hours in the hospital. I only hope that I could handle a situation like this with such grace. And I even got to hold little Ori. After holding him, Cora felt like a giant. My little baby isn't so little any more. It is so amazing to see these little babies and watch them grow. I am constantly in awe of how God created us each so unique and perfect. Each one of us is so precious and loved by Him. What an awesome Creator we have! We are praying that Ori gets to go home with his daddy and mommy soon! If you want to read more of their story check out Julie's blog here.